Chris and Marcia Wasielewski look at a floragraph of their late son, Adam, during an event held Tuesday at the Lifeline of Ohio office in Columbus. 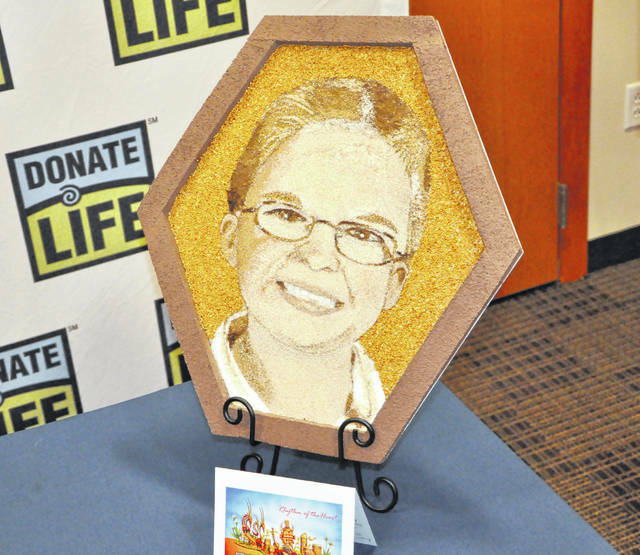 To honor Adam, a cornea and tissue donor, the floragraph will be part of the Donate Life float that will appear in the upcoming Tournament of Roses Parade in Pasadena, California. 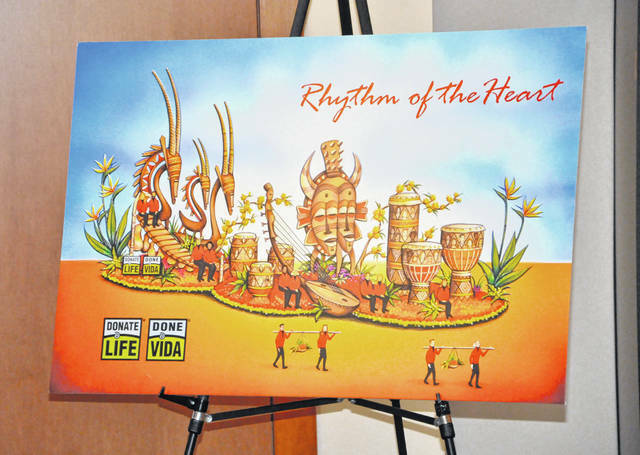 Titled “Rhythm of the Heart,” the Donate Life float featuring Adam Wasielewski’s floragraph will be unveiled during the Jan. 1, 2019 Tournament of Roses Parade in Pasadena, California. This floragraph of Adam Wasielewski, a 6-year-old Delaware resident who died in an automobile accident in 2010, will be attached to the Donate Life Rose Parade float. The memorial portrait was created in Pasadena, California, using floral materials. Marcia Wasielewski described her son, Adam, as “full of life,” always happy, and living his life to the fullest. Whether he was playing sports or engaged in other activities, the always-active 6-year-old was constantly up to something, going about his days with the innocence and genuine joy of a boy who understood how to get the most out of life. Tragically, Adam’s days were cut short in June of 2010 when he passed away due to complications stemming from a car accident. But while his physical presence may be gone, the vibrant and affectionate nature of Adam’s spirit continues to live on through the countless number of people who have benefited from his cornea and tissue donations. According to facts submitted by Lifeline of Ohio, there are currently more than 114,000 people on the national waiting list for organ transplants, with that number only continuing to increase. In Ohio alone, more than 2,900 people are awaiting organ transplants at any time, with hundreds more awaiting tissue and corneal transplants. A single donor can potentially save the lives of eight people and help restore the lives of more than 50 others between organ and tissue donations, and in Adam’s case, it is only fitting that a boy who displayed so much liveliness has provided life to so many others. Adam’s legacy, however, is not restricted to his Delaware home or the homes of those he has impacted with donations. In fact, he will soon be represented in perhaps the most famous parade in the country — the Tournament of Roses Parade — which will be held on Jan. 1, 2019 in Pasadena, California, ahead of the Rose Bowl, and will be televised all across the country. For the 16th consecutive year, the Donate Life Rose Parade Float will make its appearance in Pasadena. Forty-four floral portraits or “floragraphs” of deceased donors, including Adam’s, will adorn the “Rhythm of the Heart” float. The theme of this year’s float aims to highlight the musical diversity and rhythms of Africa. Because all visible aspects of Rose Parade floats must be made of plant material, the donor portraits are creatively constructed using a wide variety of materials, including ground flower petals, cream of wheat, coffee and quinoa. Adam’s floragraph was created in California by Martha Alonso and sent to Central Ohio where Marcia and her husband, Chris, put the very last touch — the eyebrows — on the art. It was unveiled to a room of family and Lifeline of Ohio employees at a ceremony on Tuesday morning at the Lifeline of Ohio headquarters in Columbus. Alonso, an ambassador to the Donate Life program from Los Angeles, said this is her 12th year of doing the floragraphs, with each one taking close to a day to create. Asked what she would like to say to the Wasielewski family, Alonso said she would like to thank them for being so selfless during the most painful time of their lives. Alonso, who has children of her own, said Adam will live on through his legacy, which is kept alive through the Wasielewski family. The Wasielewskis and their daughter, Emma, will travel to Pasadena days before the parade to volunteer their time to finish up the Donate Life float before watching their son be represented in the iconic New Year’s Day tradition. Alonso said she hopes to be able to meet the family during that time. Following the parade, the family will attend the Rose Bowl Game. But as of Sunday, attending the game took on an increasingly special meaning for the Wasielewski family, who are Buckeye fans. Marcia Wasielewski said, with a laugh, that the Buckeyes ending up in this year’s Rose Bowl is “such an Adam thing.” Chris Wasielewski added the game will be “icing on the cake” for an amazing experience honoring Adam’s memory. Ohioans may declare their wish to become a donor by registering online in the Ohio Donor Registry through www.lifelineohio.org. Additionally, they may do so when renewing their driver’s license or by calling 800-525-5667.